Come on … it’s technically still Winter so bring on the snow! On this fun adventure I take you the LONG WAY back to the geodesic bio dome where my winter garden is growing. 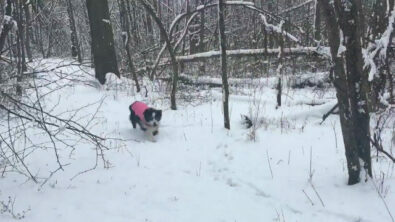 My puppy Olivia is have a great time racing around in the heavy snow that fell earlier that day. Listen to the birds, jump over fallen trees and check out the green still thriving in the woods in the video below. Visit my YouTube channel to view this video and more fun gardening shares. Grabbed these from the video because I forgot to snap a few photos during my adventure out to the dome in the snow being pelted with snow. 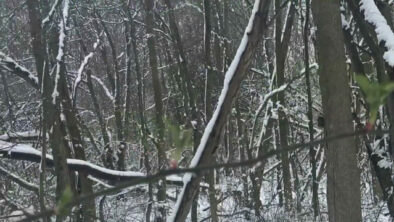 Screen Grab of Olivia running through the snow in the woods during the video. 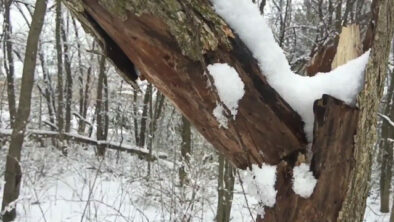 The ash tree just hanging by the last splinters in the woods. That is sleet… still having fun in the winter! I love sharing my images from my iPhone onto my Flickr Account I’ve had since 2007. In the collection below are the photos I snapped while out in the dome capturing the video content in this blog post. Are you on Flickr? View this collection and more on my Flickr Account I’ve had since 2007. PIN ME! This is the perfect image to add to your Pinterest board so you can share with your friends. JOIN ME! Can’t wait to share more gardening fun with you so be sure to subscribe to my YouTube Channel and of course my Email list so I can better assist you this growing season.